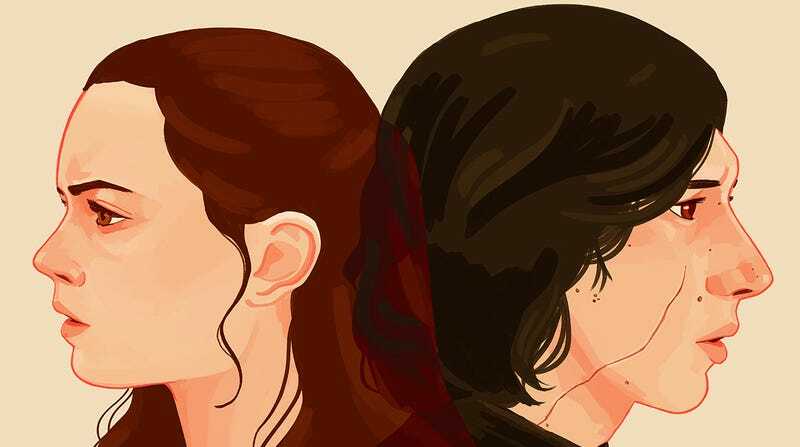 A crop of Nan Lawson’s Last Jedi Meet Cute from Gallery 1988. Whether in life, art, or fandom, romance drives us all. We imagine ourselves with the one we love. In TV and movies, we cheer for characters to live happily ever after. And these days, even if those fictional people aren’t necessarily involved, we just “ship” them together. Easy-peasy. That desire to see people truly connected is the heart of artist Nan Lawson’s ongoing art series called “Meet Cute,” which has its third exhibit starting Friday, February 1 at Gallery 1988 in Los Angeles, CA. Here are just some of Lawson’s sci-fi “Meet Cutes” from the upcoming show including, yes, Rey and Kylo Ren. Eowyn and Aragorn from The Lord of the Rings. Since the show opening Friday is called “Meet Cute 3,” obviously, there have been two previous shows, the remaining pieces of which (including characters from Firefly, Buffy the Vampire Slayer, Blade Runner, Space Jam, Fifth Element, and more) you can see, and buy, at this link. However, for part three, Lawson wanted to do something a little different. For now though, we have these “Meet Cutes,” which you can first buy at the gallery opening—February 1 from 7-9:00 p.m. at Gallery 1988 in Los Angeles, CA. The show then remains on display through February 16 (so you can get some Valentine’s Day shopping done), and all remaining prints will go on sale Saturday, February 2 at the Gallery 1988 website.